Our Emergency Medical Services Academy is a critical part of the Planning/Training Division and operates under the direction of Deputy Chief Rich Elliott. 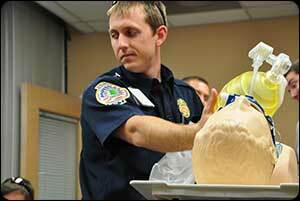 The EMS Academy provides entry-level, continuing education, and refresher courses for CCFES employees. Our courses are also open to the community. 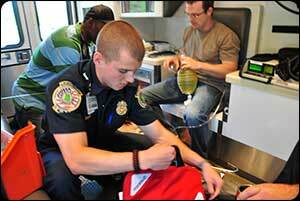 WHY BECOME AN EMT-I OR PARAMEDIC? It is not only a great way to make a positive impact but it is also a great career that provides you with new challenges every day! 6-Month program taught by our experienced instructors will prepare you to respond to trauma, cardiac, respiratory, circulatory and many other medical emergencies. Our 2-Year “firefighter shift friendly” schedule will take your career to a new level. During this course you will learn the complex knowledge and skills necessary to provide great pre-hospital patient care. 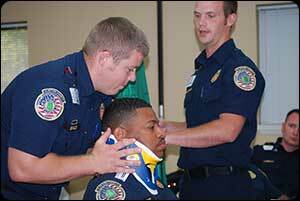 Clayton County Fire & Emergency Services also offers CPR Certification Classes for the general public throughout the year. The intent of these classes is to equip citizens with the knowledge and understanding needed during a cardiac emergency. To register for one of these classes please fill out the CPR/AED Registration form.